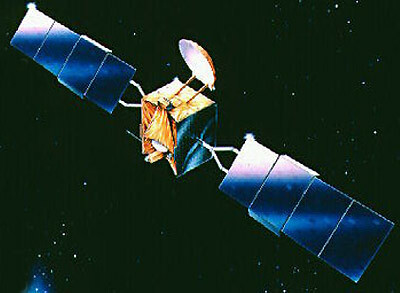 Intelsat K, Intelsats first Ku-band only satellite, was originally built as Satcom K4 for GE Americom, but was acquired in 1989 and required extensive payload modifications. It is a single spacecraft purchased to meet critical requirements for Ku-band capacity over the Atlantic region, driven primarily by international broadcasters. It is based on AS-5000 series bus. 3-axis stabilized using magnetotorquers. Hydrazine propulsion system. Two large solar panels with 1-axis articulation provide 4800 W BOL. 4 50 Ahr NiH batteries. The communication payload consists of 16 Ku-band transponders which can be configured into 32 high quality television channels. This permits access from ground antennas 1.2 meters dia. and smaller. After New Skies was spun off from Intelsat, the satellite was renamed NSS K.